The Ryder Cup is a biannual tournament played between golf players from the US versus golf players from Europe. Although technically not a major event, this tournament is always full of excitement and tends to be one of the best tournaments of the season. 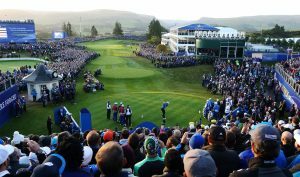 The venue where it’s played changes every time, with one tournament played in Europe and the next in the US, the actual golf courses also change. This year, Team USA will be the hosts and the tournament will take place in Hazeltine National Golf Course, in Chaska, Minnesota starting this Friday September 30th until Sunday October 2nd. Europe has won 6 of the last 7 tournaments, so Team USA is due for a win, and they have a pretty good chance considering the Europeans have a total of 6 Ryder Cup rookies in their team this year. This year’s team captain is Davis Love III, and there are five vice-captains, Jim Furyk, Tom Lehman, Steve Stricker, Tiger Woods and last minute addition Bubba Watson. Rounding up the team we have, Matt Kuchar, Rickie Fowler, J.B Holmes, Ryan Moore which are all captain picks, and Dustin Johnson, Zach Johnson, Brooks Koepka, Phil Mickelson, Patrick Reed, Brandt Snedeker, Jordan Spieth and Jimmy Walker. Team Captain Darren Clarke, vice-captains Thomas Bjorn, Padraig Harrington, Paul Lawrie, Ian Poulter and Sam Torrance. This year’s captain picks are: Martin Kaymer of Germany, Thomas Pieters of Belgium and Lee Westwood of England. They will be joined by Rory McIlroy of Northern Ireland, Danny Willett, Chris Wood, Justin Rose, Andy Sullivan and Matt Fitzpatrick of England, Henrik Stenson of Sweden and Sergio Garcia and Rafael Cabrera-Bello from Spain. Team USA is the favorite in the tournament with a price of -220 while Team Europe is a+190 dog. There are several factors that went into setting this line, on the one hand we have the revenge factor, then we have the home field advantage, the experience of the team players and the US has some big hitters and great putters. But if history has taught us anything is never to under estimate the Europeans, they have a lot going for them; collectively they tend to be a more laid back bunch and they will come into the tournament with less pressure than their American counterparts, they play as a team meaning there is a sense of camaraderie which might be missing from the US team; they also have Ryder Cup veteran’s Sergio Garcia and Justin Rose who have outstanding career records, and we can’t forget recent history. I pick Patrick Reed of team USA to end up as the Most Valuable Player in this tournament, and although -220 is a bit pricey it is none the less the right side of the bet. The actual player pairings won’t be announced until a day before the tournament is set to start, but I expect Phil Mickelson will have a good performance, I am looking forward to seeing Rafael Cabrera-Bello make his debut, I think he will have a good outing, and I don’t expect Rory McIlroy to do well, in fact I think he will end with a losing record. Make sure to check out the tournament odds and match ups at www.AceSportsbook.com.